In one half hour our boat began to rot. One each side four upon the outward side. In three miles going, almost to our knees. And left our boat as bottomless as hell. Scarce able with a cane our boat to set. It was clearly a tall tale, but the stunt gave him plenty of publicity and helped to increase the sales he was able to make from selling copies of his poem. 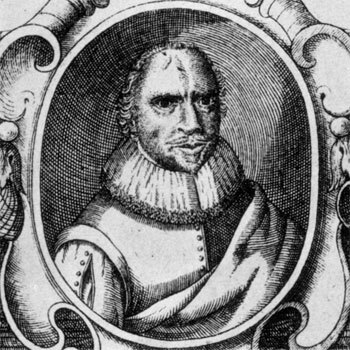 John Taylor had been born in Gloucester in 1578 and in his teens became a Thames waterman, the equivalent of a modern taxi driver. He fought at sea against the Spaniards and rose to become the organiser of pageants for special occasions. He also fancied himself as a poet, his poem The Sculler being one of his earliest published works. It forms part of the British Library’s current exhibition Writing Britain. By 1630 he was able to publish a magnificent collection of his works, over 150 poems. None of the poems are very good, but they are studied for what they reveal of the life and times of people in the early modern period. He was well-enough known to be able to draw attention to pet subjects: he gained the support of King Charles 1 when he campaigned against the pollution and hindrances to navigation of some of England’s rivers. This blogpost explains some of Taylor’s stunts. Or else their lines had perish’d with their lives. Sir Edward Dyer, Greene, Nash, Daniell. Do live in spite of death, and cannot lie. John Taylor’s immortality was ensured by making use of the power of the printing press. In fact, as far as we know, Taylor was much more concerned to keep his name alive for all time than Shakespeare ever was. This entry was posted in Shakespeare's World and tagged British Library, John Taylor, Shakespeare, The Sculler, Water poet, Writing Britain. Bookmark the permalink. I had heard of his name before but knew nothing about him, so thanks for your informed blog about this strangely wonderful bloke. He was obviously the first person to create a kind of inflatable kayak! Was he trying to prove that paper is a perishable material and therefore books should be preserved? I think he probably was making the link between his work as a poet and boatman, so in a way he was! This is fascinating, Sylvia. Like Richard, I knew the name but nothing else. He sounds a little like the poet George Gascoigne who also had a military career and was a deviser of masques, in particular the one given by Leicester at Kenilworth in 1575 for Elizabeth I’s visit, but who came from a higher social level than Taylor and was also in a different literary league. 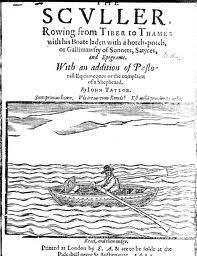 Perhaps Tom Stoppard used John Taylor as the inspiration for the Thames waterman who rows Shakespeare to his assignations with (the fictitious) Viola de Lesseps in Shakespeare in Love! This character tells Shakespeare that he also happens to be a writer. It hadn’t occurred to me that this might be a deliberate reference, but I’d certainly made the link between the waterman and Taylor. I’d forgotten that he mentions he’s done some writing of his own. Taylor’s a great character isn’t he? SCLA has a copy of his works: must have been a major venture getting it published. I’m fascinated by all things John Taylor. At http://www.williamdobson.tv/research/ you can see the portrait of Taylor that William Dobson painted in Oxford during the Civil War. It’s an interesting story. By the way, Taylor came from a family of painters, and his brother is one of the names proposed as the painter of the famous putative portrait of Shakespeare in the National Portrait Gallery. Sylvia, I’ve spotted that the Friends of Gloucestershire Archives have a forthcoming talk on John Taylor on Thursday 1st November. The talk is being given by Dr John Chandler who is the county editor of the next Victoria County History volume for Gloucestershire (Vol.XIII) – see http://www.foga.org.uk/12wintevents.html for details. I attended the talk at Gloucester Archives, and very good it was too! The speaker, John Chandler, has also written a very interesting book on Taylor. Some of Taylor’s work can also be found on Eebo if you have access. Thanks for this insight. I heard about the lecture but was unable to go!